As a teaching professor whose research includes solar and infrared radiation processes in snow, clouds and sea ice, the Antarctic climate, oceanic processes on Snowball Earth and global cloud climatology, Dr. Stephen Warren from the Department of Atmospheric Sciences at the University of Washington, Seattle has spent part of his professional life looking at black carbon. 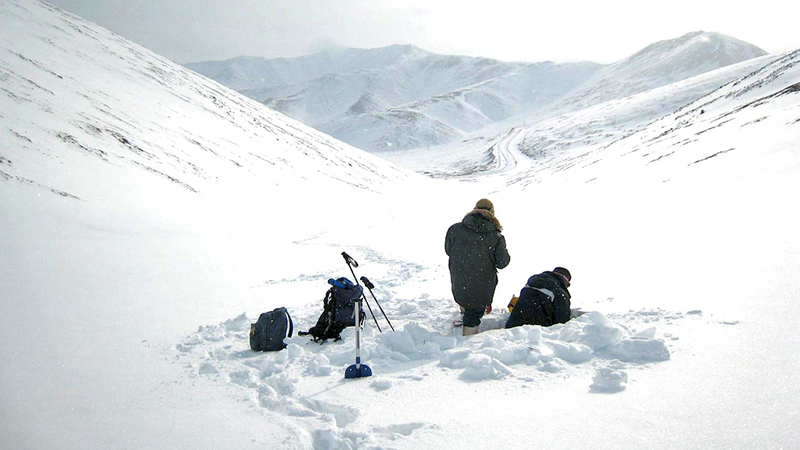 At the moment, Dr. Warren is involved in a project in which he and his colleagues are collecting samples of snow from across the Arctic in order to determine black carbon concentrations in the snow, updating and expanding on the Arctic snow sampling campaign that Dr. Tony Clarke and his student Kevin Noone, also of the University of Washington at the time, carried out in 1983-84. Dr. Warren recently lent some of his time to SciencePoles to discuss his current research project as well as other research projects looking into black carbon his colleagues in polar science are involved with. How did you first become involved with researching black carbon? My interest in black carbon started about 28 years ago, when Dr. Warren Wiscombe and I were trying to explain measurements of snow albedo. The calculations were higher than the measurements, and we eventually concluded that what we were measuring was not pure snow. It turns out that very small amounts of impurities can increase the absorption of sunlight and reduce the albedo. Those were measurements that had been made in the Arctic. It was known that the Arctic atmosphere was polluted, and in fact calculations had been done on the effects of so-called Arctic haze on the climate. But then eventually that soot comes out of the atmosphere and gets into the snow and affects the surface radiation. Our calculations of snow albedo inspired my colleague Dr. Tony Clarke, who at that time in the early 1980s was at the University of Washington with me, to survey the Arctic snow. He managed to get samples of snow from various places in the Arctic and got them shipped back to Seattle frozen, and then he and his student Kevin Noone analysed them for their soot content. They published their results in 1985. So that was 23 years ago. He also made some estimates of the contribution of black carbon to the heat budget of the Arctic region. Was that the first time anyone had done that? That was the first time. I had done the calculations showing that it could be - well, that it was significant at these measurement sites, where the albedo had been measured. But we didn't know if that was representative. In fact, that (a lot of the pollution we were seeing) was due to local pollution. So what Dr. Clarke did was get samples from various places around the Arctic that would be representative of large areas. That was the first time it (any measurements of black carbon in snow) had been done. But not much attention was paid to it until almost 20 years later when the climate modellers, particularly Dr. Jim Hansen from NASA Goddard Institute for Space Studies, was trying to explain various aspects of climate change and suspected that this (black carbon) was something that needed to be added to climate models, and he came up with a surprisingly large effect when he factored it into his climate model. There are a number of considerations (to keep in mind). First of all, the snow is significantly polluted only in the northern hemisphere. The amount of soot that reaches the Antarctic is so low that it has virtually no effect on snow albedo. In the northern hemisphere, the snow albedo is important only at certain times and places. It's not important at night; it's only important when the sun is shining. Winter is not all that important because the sun is low on the horizon and the days are short. It's mostly in the spring that it's important. In the summer it's important on the Greenland ice sheet because there's still snow in the summer there; elsewhere, the snow is mostly gone by then. So springtime is probably the most important. Also the regions that are important are the areas where the snow is exposed to sunlight - on the tundra, the sea ice, and the ice sheets. There are also great areas in the mid-latitudes that have no trees, such as the Great Plains in North America as well as in Central Asia, in Tibet, Kazakhstan and Mongolia - those areas. But in the great forests across Siberia and Canada it (snow albedo) is not so important because most of the snow is on the ground and hidden by trees. What kind of research are you involved with at the moment? My involvement now is to re-do that survey that Dr. Clarke did in 1985, going around the Arctic region, collecting snow samples, melting them, filtering the melt water, collecting the impurities on the filter, and analysing the filter. And the first thing we do is look to see how dark the filter is and we compare them against some standard filters that have known amounts of black carbon (in them). We've been collecting many of the samples ourselves, but there are also numerous volunteers who have collected samples for us. This is a project that is based at the University of Washington, Seattle together with my co-worker Tom Grenfell and Tony Clarke, who did the first survey but is now at the University of Hawaii. So the three of us got together, wrote a proposal, and it got funded. So now we're working together on that. We've obtained samples from Canada, Alaska, Greenland, Svalbard and the Arctic Ocean. Tom Grenfell and I have just completed a two-month trip to eastern Siberia collecting snow samples. We collected about 400 samples and filtered them, although the filters still need to be analysed. We still have more samples to collect, particularly in the Canadian Arctic islands next year, but most of our future work now will be analysing the filters from the samples we've already taken and then looking into some processes. I was just in Tromsø, Norway for two weeks to work on one of these processes, together with a student at the Norwegian Polar Institute, Sanja Forsstr&oulm;m; we were looking at what happens while the snow is melting. The soot is distributed through the snow; however as the snow melts the particles become redistributed vertically, particularly if they're hydrophobic. In this case the particles may stay on the surface instead of washing away with the melt water, allowing them to have a much bigger effect on albedo. So these black carbon particles don't dissolve in water? No, they don't dissolve in water. They may become dislodged from the ice grains they become attached to and wash away with the water, but they also may not. They may just attach themselves to the next ice grain and stay at the surface. So we're collecting samples every three centimetres of the snow depth every two days and then repeatedly doing this as the snow melts. I'm going to be doing the same thing in Greenland in the summer. That's one process study. Another one is we have to make the connection between our measurements on the filters and the snow's reflection of sunlight. What's important for the climate is the amount of the solar energy that's either being absorbed or reflected. We're only measuring that occasionally. Instead we prefer to collect samples of snow, melt them, filter them, and look at what's on the filter instead of making radiation measurements. The reason for this is that there are many factors that affect snow albedo. Most importantly is the grain size of the snow as well as the angle of the sun, snow depth, etc. There are many other factors besides black carbon that affect the albedo of snow, so if you're taking an albedo measurement, it can't tell you exactly what the effect of black carbon is. Actually we've been using a model to calculate the effects of the black carbon we find in the snow, but we need to test this model to see if it's accurate. In order to do that, we need to find several uniform snow packs that are identical except for the fact that they have different amounts of black carbon. We have concluded that that would not be possible in nature. So this past winter my coworker Rich Brandt got a system up and running for growing artificial snow packs with varying known amounts of black carbon using a snow-making machine like they use at some of the ski resorts, but through a side entrance injecting a solution that has black carbon. We're putting in large amounts of this solution so we can see a big signal on its ability to reduce albedo. There are actually three groups working on that. We're doing it along with a group in France at the LGGE (Laboratoire de Glaciologie et Géophysique de l'Environnement) and a group in California. They're doing it in a laboratory while we're doing it outdoors. You mentioned that it's not very useful to measure albedo in-situ, however the project being undertaken in Grenoble, France by Dr. Florent Dominé from the LGGE and Dr. Zender from the University of Califronia, Irvine, is using an optical device to try to measure black carbon's effect on snow albedo. From what you said it sounds as if it might be difficult to do this. We've been measuring snow albedo for many years. It's difficult to get accuracy down to within 1% because there are many sources of error in albedo measurement. But the effect of soot that we expect in nature is only 1% or maybe 2-3%, so making measurements of albedo and relating them to the soot amounts in nature is extremely difficult. But in a laboratory situation I think it can be done when you have large amounts of soot. A lot of models seem to attribute a lot of climate warming to black carbon. Dr. Zender's models show that black carbon might have been responsible for 30% of observed warming since the beginning of the industrial age. This seems surprisingly large. Well, he's probably the best person to make that statement. In his work he's been incorporating some of the more recent measurements, not basing his models on the measurements taken in the mid-80s. Jim Hansen from NASA Goddard came up with a number that was even more than that a few years ago in his research. He concluded that the radiative forcing (Watts per square metre, which is different from temperature change in degrees) of black carbon in snow could be one quarter as much as the current radiative forcing from anthropogenic greenhouse gases. But his estimations were for the entire northern hemisphere, not just the Arctic, and of course the effect is localised in the Arctic, so locally in the Arctic it would have to be more than that. I suspect that it's not that large because Hansen's estimates were based on the measurements that Tony Clarke made in the mid-80s. We're finding that the Arctic snow is now cleaner than it was 20 years ago. Even though you have a lot of new pollution coming out or rapidly industrialising countries like China and India? The main thing that has happened since 1985 has been the demise of the Soviet Union, which led to the shutting down a lot of polluting industries operating there. And the continuous measurements of air that have been taken at Alert Station at the northern end of Ellesmere Island in Canada have shown a decline in black carbon between 1990 and 2000. So that's presumably due to the shutdown of polluting industries in Eastern Europe and Russia. The measurements do, however, show a slight increase starting in 2000 and that's probably due to increasing pollution from China and maybe India. There is a dispute amongst climate modellers about whether pollution from China and India can actually reach the Arctic. It can probably get there from China, although from India it's not very likely. In any case, black carbon in the Arctic seems to be increasing now, although it's still lower than it was in 1985. Our snow samples are a lot cleaner than they were back then. What kind of research still needs to be done in order to make more accurate assessments of how black carbon affects local climate? How good are the models we have now and how much more can the models be improved? I guess first we need to know what is the current situation of black carbon in the Arctic, and then we need to find out where it's coming from, what the sources of pollution are, what routes they take to get to the Arctic. Different climate models were, as recently as a year and a half ago, in disagreement on these points. At a conference I went to a year and a half ago there were two groups that were disagreeing about possible sources for transporting black carbon to the Arctic. The group from NASA in New York City (Kohl and Hansen) and the group from the NILU in Oslo (Andreas Stohl) were both running trajectory models that tried to simulate what happens to pollution from different regions and how it can get into the Arctic. We also need to know which types of sources of black carbon are mainly responsible. Are they mostly industrial sources or are forest fires the largest contributor? Stephen Warren is a professor at the Department of Atmospheric Sciences, and Department of Earth & Space Sciences at the University of Washington in Seattle. His research interests include solar and infrared radiation processes in snow, clouds and sea ice, Antarctic climate, black carbon in Arctic snow, oceanic processes on Snowball Earth, and global cloud climatology.